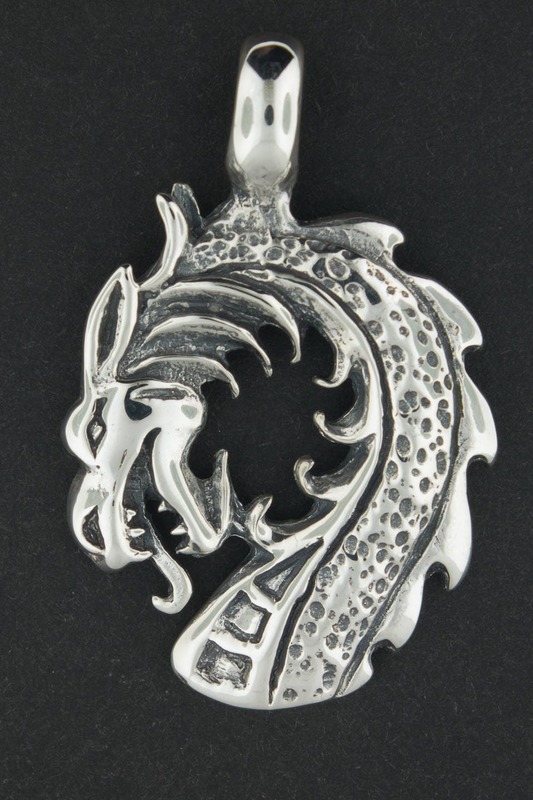 This sterling silver dragon head pendant design is really interesting! 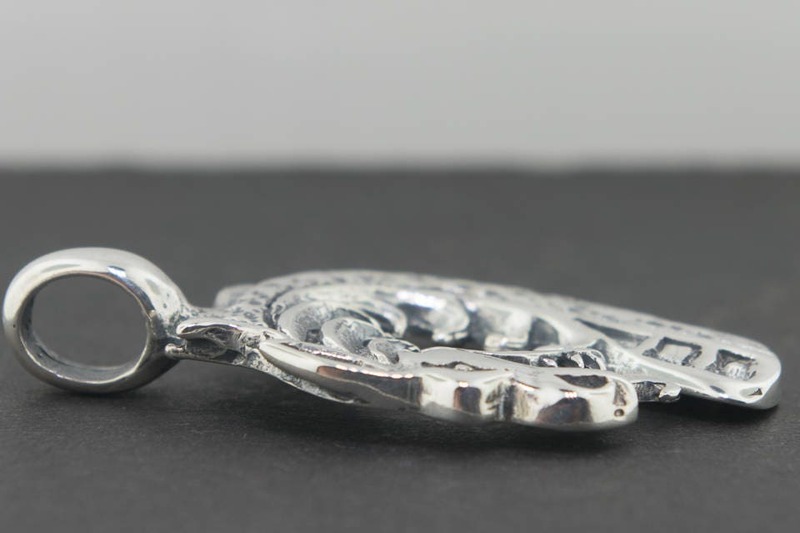 This pendant is made in sterling silver(.925) and is 4.5cm long and 3cm wide. The bail is rather large, and can easily handle a 1/4 inch chain. It's a very solid piece, and can easily be worn every day. Occasionally I go around a look for inspiration for new pieces, especially for ideas not found here in Montreal. Sometimes I come up with a creative idea inspired by nature. Sometimes I see something available only in pewter or costume jewellery that people like me can't wear due to skin allergies. This is one of them. This pendant is one of several I found at a wholesale trade show. Loved the design, but alas it was in pewter! So, I bought several different designs that I thought would be nice, fixed up any molding flaws(there are tons in mass produced jewellery of all sorts!) and made my own molds to make them in sterling silver or antique bronze, a mixture of copper and tin. So now I and lots of other people allergic to costume jewellery can wear these beautiful pieces! This pendant is absolutely beautiful, exceeded my expectations. Arrived quickly considering it had to go through customs. This was an anniversary gift for my husband, and he loves it! Thank you so much! Fast shipping, fantastic product, pictures do not do it justice! 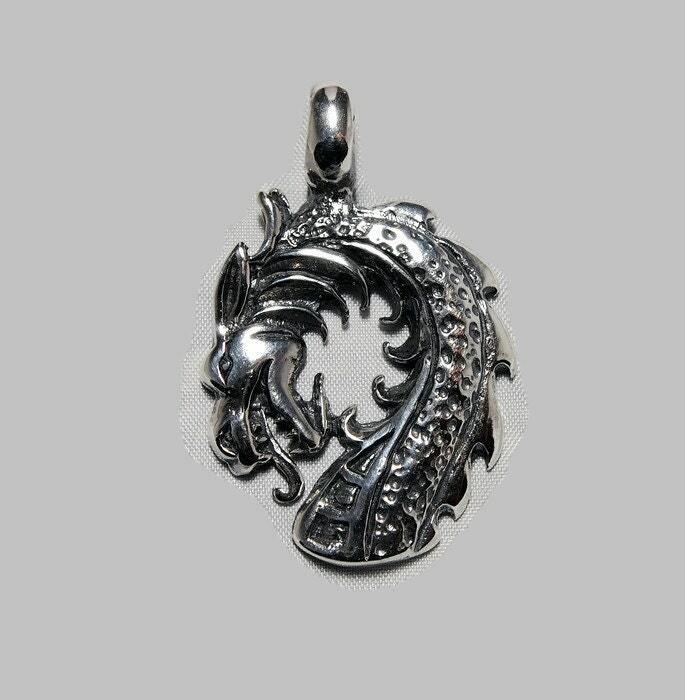 This is a heavy, finely detailed silver dragons head that looks great and wears well! The large chain loop is appreciated, but note it wont fit some of my "mens" sliver chains (which tend to be larger gauge). Very happy with the purchase! Absolutley beautiful - love it!